It’s rather rare that I get to read and review a book written by an author that I personally know. Granted, I don’t know Yardley well, but I know her. We worked together on a project that didn’t end up working out for either of us. We’ve had a ton of private message exchanges about plenty of things. I even met her for brunch once wherein my kid and husband crashed our party and she was kind and gracious with their company. The thing is, once you know someone, it changes how you read their book. You know the person who wrote it now. You’ve interacted with them in person. It adds some depth and some interesting new dynamics to the work as a whole. Yardley is, from what I know of her, one of those people who seems to shine in the face of adversity. Life hasn’t been easy for her, but she smiles and she’s nice and kind anyway. It’s rare to find gems like that these days, but Yardley is one of those people. Her kindness shines like a light, attracting everyone to her. That’s so refreshing in our jaded day and age. And I was thrilled – absolutely thrilled – to see that as one of the primary strengths of Pretty Little Dead Girls. Bryony is one of those characters that I really thought I’d hate. In fact, about two pages in I thought to myself, “Oh god. Why did I have to agree to read this? I really, really hate Mary Sue characters.” Bryony has all of the features it takes to get me to hate a character almost instantly. She’s happy all the time. She’s overly sweet. She’s absolutely innocent, and she makes everyone want to protect her. Bryony can do no wrong because that’s who she is. Now that it looks like this has taken a turn for the worst, let me turn the tables on you. Bryony Adams is one of those characters that would be so easy for me to hate, but I didn’t. In fact, I absolutely loved her, and that should really tell you something about the way Yardley has written this book. If she can take someone like me, who is just about dead set to viscerally dislike anyone who is unnaturally pleasant to be around (Really people, there is such a thing as “too happy.” It’s weird.) and made me actually really root for Bryony, that sends a loud message about the quality of the characterization. One I don’t really need to expand upon. 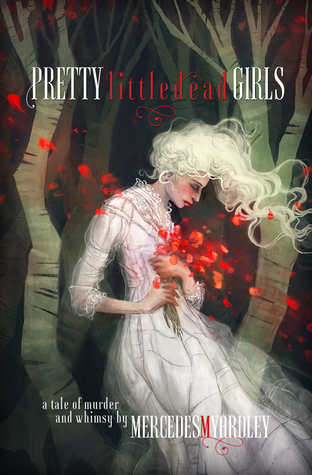 Pretty Little Dead Girls is written in a very unique way, sort of omnipotent third person. While the main focus is on Bryony, we get bits and pieces from all of the people around her and the people engaged in her gruesome fate. It’s an interesting hodgepodge tapestry that Yardley has woven. Normally this style of storytelling falls apart fast and in a messy way, but not here. Yardley managed to pull everything together and keep it from ever getting messy. It’s easy to keep track of who is who and why they are doing what they are doing. Motivations are right on the surface and while Bryony is the obvious star of the story, the central force where everything spins around her, the other characters are interesting, but obviously supporting roles to Bryony’s light. The interesting way of telling the story is also very effective. Words are tools, and it’s obvious that Yardley has utilized that tool to its fullest extent with Pretty Little Dead Girls. The book feels like a fairytale, and the people who say that this novel feels a lot like Neil Gaiman aren’t wrong. This does feel very much like Gaiman’s fairytale twists. The powerful prose, and the way that Yardley has chosen to tell her tale immediately draws in readers. It’s hard to put this book down. I blasted through it in a little over a night, and I didn’t even mean to, especially when I was pretty sure I was going to hate it when I started it. It’s hard to put down, and there are plenty of quotable gems scattered through it. Bryony Adams was the type of girl who got murdered. And then we are introduced to this person, and all of the people who feel sorry for her due to the fate that is looming over her. Bryony is called “Star Girl” throughout the book, and she truly does shine like a star. As I mentioned above, Bryony is the sun and everyone else is just orbiting around her. She’s light, she’s innocent, and she’s all of those qualities that the world tends to beat out of people before they are very old. However, the book itself is pretty dark. It’s about death and destruction, about people breaking down and falling apart, about being unable to stand in the face of our base natures and Bryony is the light that keeps all of those shadows back. It’s an interesting spin on human nature, and nothing really contrasts more than hope and life against death. I enjoy books with contrasting elements, but usually those elements are subtle. Not here. Pretty Little Dead Girls is based on those contrasting elements. They are laid out right there on the first page for readers to see. And that, folks, is why Pretty Little Dead Girls worked so well for me. It was a study in contrasts – light against dark, subtle against loud, hope against disbelief, hunger against satiation. Pretty Little Dead Girls is all of those things that make us human, picked apart and thrust in the open for us to internalize in our own unique ways. It’s a study of what makes us human, and it’s also a study of strength, and the different kinds of it. It’s not what I expected, and I’m so glad. Yardley absolutely blew me away with this novel, and she’s a friend of mine, which makes it that much more gratifying to be so blatantly honest about the book she obviously poured her soul into. And what a beautiful soul that is. P.S. I wrote this review while medicated because yay surgery. I sincerely hope it makes sense.